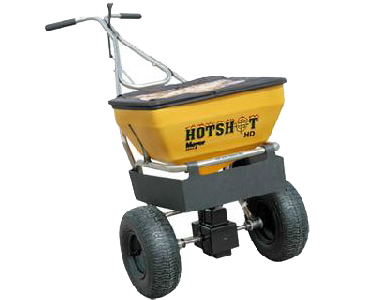 Use this Meyer Hotshot 70HD Spreader year round for maximum use. Spread salt, sand, limestone, fertilizer and other granulated material from the 0.90 cu. ft. hopper that holds up to 70 lbs. Control the material flow with an easy-to-read dial that is positioned on the outside of the hopper for convenience. And, push this spreader over rough terrain and icy pavement using the 13 inch heavy-duty, ice-gripping tires. .
13" Heavy Duty Tires: Enhanced traction and ice-gripping tread is available with the 13 inch heavy duty tires. equipment seems well built, but not sure it's worth the extra money. Disappointed that distribution of media is not more variable. Ask us about the Meyer Hotshot 70HD All Season Walk-Behind Broadcast Spreader. Please no repair questions. Your Q&A may be posted to SnowblowersAtJacks.com to help other shoppers, like you, with their purchasing decisions. Thank you.